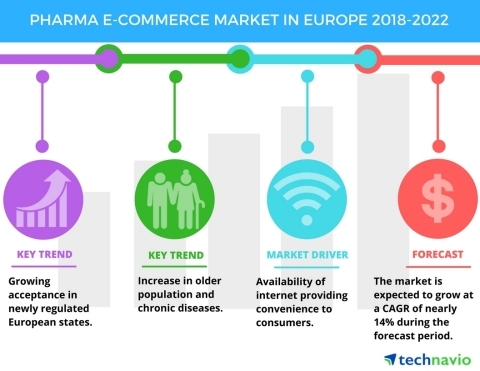 Technavio market research analysts forecast the pharma e-commerce market in Europe to grow at a CAGR of nearly 14% during the period 2018-2022, according to their latest report. This market research report segments the pharma e-commerce market in Europe into the following products (Rx and OTC) and key regions (UK, Germany, and ROE). It provides an in-depth analysis of the prominent factors influencing the market, including drivers, opportunities, trends, and industry-specific challenges. The availability of internet is one of the key driving forces behind the growth of the pharma e-commerce market in Europe. This is because it provides convenience to the consumers for ordering medicines. The consumers can order medicines easily with their mobile or computer. In offline purchase criteria, a consumer may need to go to multiple stores to get the prescribed medicine. But an online platform can aggregate supplies and makes it easy for consumers to find the required medicine and order it. It is also beneficial for the governments to form policies as the data generated from the online platform can be analyzed and used for planning public health policies. Consumers can get additional information such as side effects, information on low-cost substitutes of the medicine, medicine reminders, and drug interactions by using online platform. This will help them in making decisions for better online purchases. According to a senior analyst at Technavio for retail systems, "It is estimated that in around 17 European countries, there are over 350 million internet users and over 7,000 authorized pharmacy e-commerce websites. Among these authorized pharmacies, many are multi-channel leading pharmacy chains, some are small-scale enterprise businesses, and others are larger cross-border pure play mail-order pharmacies. The European countries are trying to improve security, consumer safety, and trust in mail order and internet pharmacies. This will increase the adoption of e-commerce pharmacies among consumers." Of the two major products, the Rx segment held the largest market share in 2017, accounting for nearly 57% of the market. However, the market share for this product is expected to decrease slightly by 2022. The UK was the major revenue contributor to the pharma e-commerce market in Europe, accounting for more than 67% of the market share. This is because the region is an early adopter of advanced technology because of the availability of high-speed internet and awareness about e-commerce. Technavio's best deals of the month!